I think we really want to stress the slippery slope. 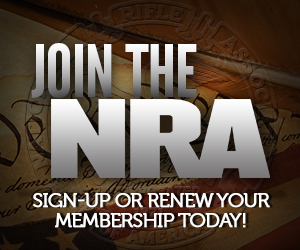 California already banned the sale and import of magazines over 10 rounds over 15 years ago. They called it “common sense” and “reasonable” then. Now they want you in jail. Now they want to reneg on the grandfather clause they built into that ban, as they will always do when they feel they can. California now admits that bans on sales are not the answer- they need confiscation. We need to hold Hillary to this when she wants to ban sales nationwide, but says if you like your current magazines, you can keep them. Because gun control is more of a state and local issue now, there are opportunities to pit locales against each other because they are working at different points in the disarmament timeline. They won’t bite, because they will never show any ill will towards any level of gun control, but it draws attention to how they are not after just a few common sense tweaks. This is brilliant We do need to destroy the political lives of those who want us in jail or dead. Too bad it’s on Facebook. 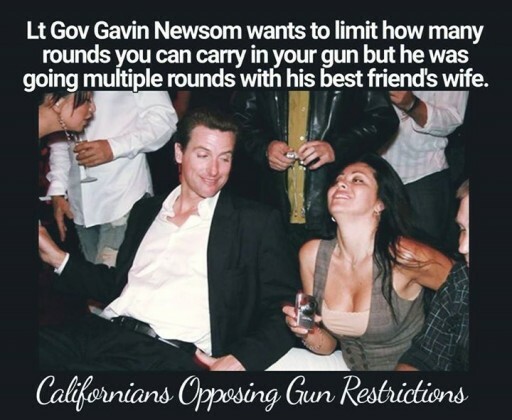 Gavin Newsom is a notorious greaseball hair’d coke-addled idiot. His father was the Attorney/Judge who was owned by the Getty oil-family and the only reason he’s even in politics is the machinery behind him. He’s a puppet. note that the lady in the picture is not Ruby Rippey, the blonde wife of his friend. Another odd error in the poster is understating just how ethically rotten Newsom was, as Newsom didn’t just commit adultery, he was messing with his subordinates in public office! San Francisco Mayor Gavin Newsom’s re-election campaign manager resigned Wednesday after confronting the mayor about an affair Newsom had with his wife while she worked in the mayor’s office, City Hall sources said. Alex Tourk, 39, who served as Newsom’s deputy chief of staff before becoming his campaign manager in September, confronted the mayor after his wife, Ruby Rippey-Tourk, told him of the affair as part of a rehabilitation program she had been undergoing for substance abuse, said the sources, who had direct knowledge of Wednesday’s meeting. That is very interesting, and a plausible accusation against Newsom. So the question is, is the real driving force behind the anti-gun referendum effort Newsom running for Governor? Or is it Bloomberg using his money to push gun control? Don’t see why it can’t be both. And worse. Bloomberg is buying the next governor of California. Wow. How 19th Century. Eastern money dominating Western politics. Secession from the Union isn’t lawful. What about expulsion?